One of the most American of cookies is the Snickerdoodle, sweet buttery balls of dough rolled in cinnamon sugar. Get to the eating all the quicker with this delicious bar cookie recipe. 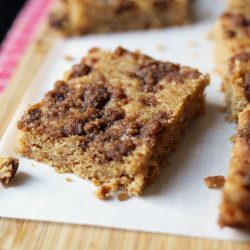 These Snickerdoodle Bars are easy to make and taste just as good as the classic without the work. Preheat the oven to 350 °. Line a 9x13 baking pan with parchment paper. In a large mixing bowl, combine the sugar and oil. Mix in the egg and vanilla until smooth. Add the flour, baking powder, cinnamon, nutmeg, and salt. Blend just until mixed. Spread into the prepared pan. The dough will be fairly thick and appear a little greasy. In a small bowl, combine the topping ingredients and sprinkle them over the batter. Bake for 20 to 25 minutes or until crisp. All the dish to set for about 10 minutes before removing the entire piece, holding onto the edges of the parchment, and placing it on a wire rack to cool completely. Slice into squares and serve. Store cookies in an airtight container for up to a week. To freeze: Cool the bars completely on a rack. Package cooled cookie bars in an airtight container and freeze for up to 6 weeks.